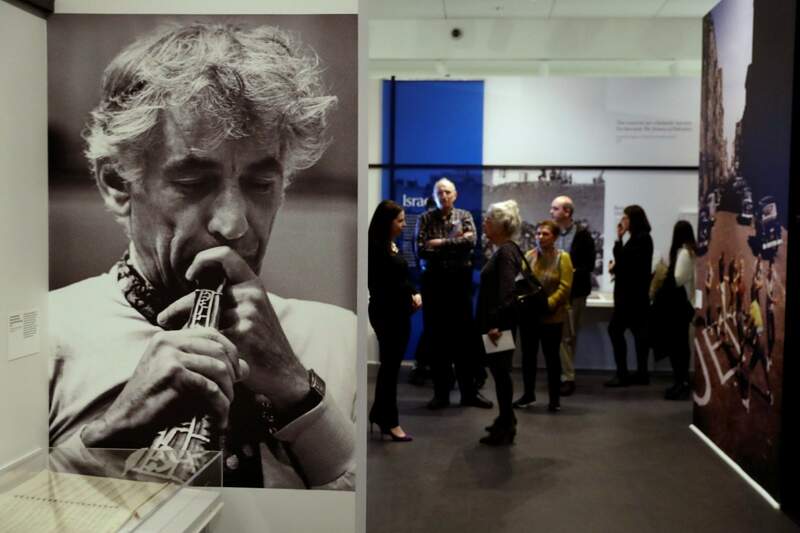 Journalists walk through the Leonard Bernstein exhibit during a press preview at the National Museum of American Jewish History in Philadelphia. The exhibit on the acclaimed composer and conductor runs through Sept. 2. PHILADELPHIA – In October 1979, Leonard Bernstein received a fan letter from a high school humanities teacher. Helen Morgan wrote to the celebrity composer-conductor-pianist in hopes he could share the theme that guided his compositions – something she could pass along to her students for inspiration. Holocaust survivor orchestraIn May of 1948, 29-year-old Bernstein was on a European conducting tour, and was asked to take a side trip from Munich to conduct a small orchestra of Holocaust survivors living in displaced persons’ camp. Asthma prevented him from serving during the war and so conducting the group of 17 players was his first confrontation with the weight of the Holocaust, Weingram said. The event had a lifelong impact on him. 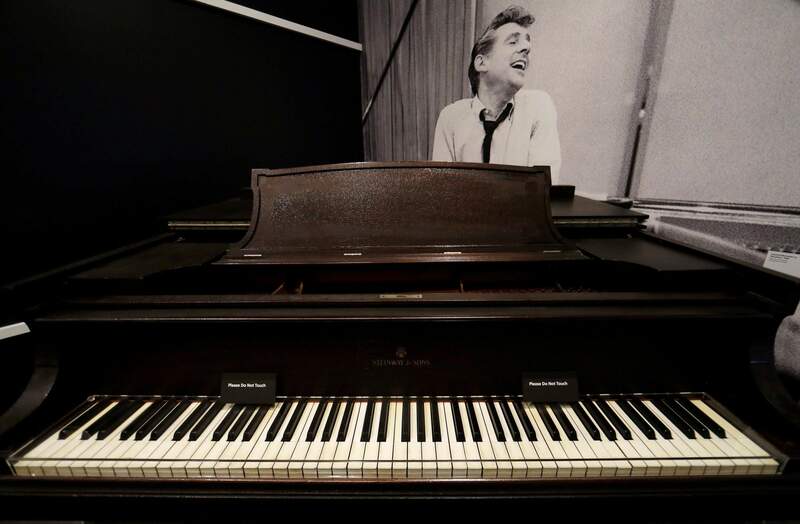 A piano gifted to Leonard Bernstein is on display during a press preview of an exhibit on the acclaimed composer and conductor at the National Museum of American Jewish History in Philadelphia. The exhibit runs through Sept. 2. East side storyFans of the immortal “West Side Story,” the Romeo-and-Juliet tale set amid Manhattan fire escapes and street gangs in the late 1950s, might be surprised to learn the show was initially called “East Side Story.” It was a tale of Jewish and Irish Catholic gang rivalry set on the New York City’s Lower East Side, on the eve of Passover. ‘Mass’ for JFKJacqueline Kennedy Onassis had asked Bernstein to create an original piece for the 1971 opening of the Kennedy Center in Washington. He chose to memorialize America’s only Catholic president with what he called a “theater piece for singers, players and dancers” based on the liturgy of the Roman Catholic Mass. He collaborated with Stephen Schwartz (of “Godspell” and now “Wicked”) on the monumental production. 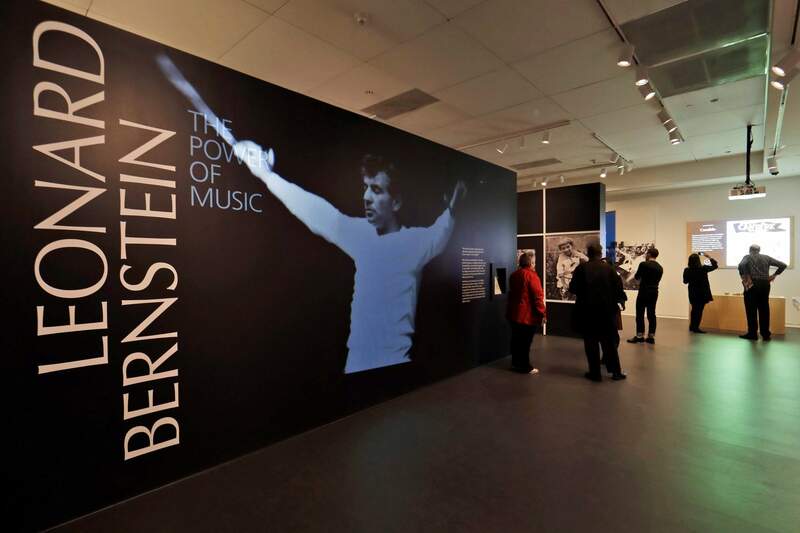 Journalists tour the Leonard Bernstein exhibit during a press preview at the National Museum of American Jewish History in Philadelphia.